WASHINGTON — For all of the talk and evidence of how the fight over Supreme Court Justice Brett Kavanaugh has fired up voters in the reddest of red states, our three NBC/Marist polls this week of Nevada, Minnesota and Wisconsin show that he’s not popular with the middle of the country. The polls asked the same question: Are you more likely to vote for a candidate who opposed the Kavanaugh pick? Or one who supported it? And here were the responses from all three states, which are holding competitive Senate, gubernatorial and House races. 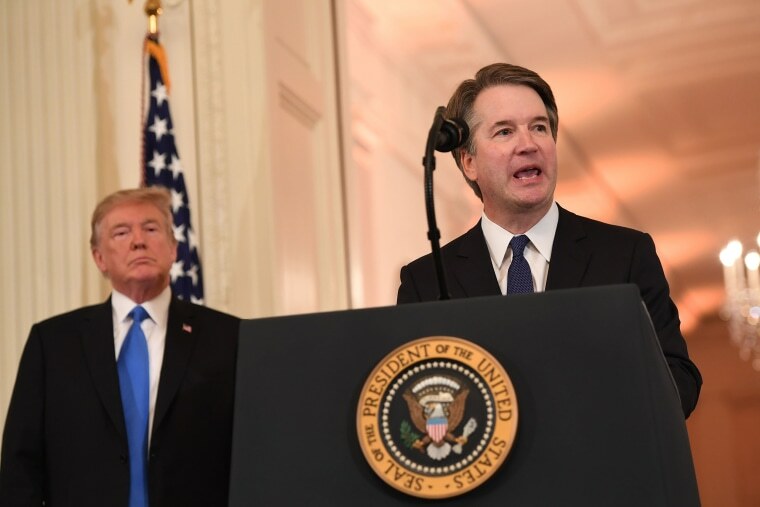 What’s more, independent voters in all three states break for the candidate opposing Kavanaugh — 36 percent to 32 percent in Nevada; 47 percent to 22 percent in Minnesota; and 41 percent to 28 percent in Wisconsin. Caveat, though: All three polls were in the field (Sept. 30 through Oct. 4) before the vote on Kavanaugh. But they were taken after the Kavanaugh-Ford hearing on September 27. Speaking of Big 10 Country, President Trump holds a rally in Lebanon, Ohio at 7:00 pm ET. Trump also told reporters yesterday that he opposes any kind of sanctions on Saudi Arabia that stop arms sales to the country. “We have to see what happens, lot of work's been done, don't like stopping massive amounts of money poured in, talking about different kinds of sanctions, military equipment spending,” he said. It’s worth noting that the Trump administration’s actions and rhetoric toward Canada (over tariffs and NAFTA renegotiation) were more aggressive than its stance toward Saudi Arabia after the death/disappearance of this journalist. Finally, most of the polls in competitive House districts — especially those in urban and suburban areas — have looked pretty good for Democrats over the past month. But this Mason-Dixon poll of FL-27 in Miami, which Hillary Clinton won by more than 20 points in 2016, isn’t good news for Dems.